To further fortify its support for Overseas Filipinos, LANDBANK bundled all its product offerings under the banner program Bagong Bayani, a fitting tribute to the modern-day heroes who are hailed for their key role in stimulating the local economy. Under its Bagong Bayani Program, LANDBANK puts forward a menu of savings and investment instruments to help and empower Overseas Filipinos to save and grow their hard-earned money for the long term, and contribute to creating jobs and livelihood especially in the countryside. LANDBANK actively partners with OFW Groups and Filipino Migrant Associations and Organizations for various activities, fora and seminars locally and abroad that help promote financial literacy to OFWs as well as their families. Card-based type of Savings Account intended primarily for Overseas Filipinos. The opening amount is only Php 100.00 with zero maintaining balance. Issued in two forms: generic and personal. The generic card is issued by LBP Overseas Officers and other ORG designated personnel upon application while the personal cards are issued by LANDBANK branches with the account holder’s name embossed on the card. Passbook-based Savings Account available at LBP Branches. It can be opened by the Overseas Filipino or his/her designated beneficiary. The opening amount is Php 100.00 but Average Daily Balance (ADB) required is Php 5,000.00. To open an ATM account, go to the nearest Landbank branch in your area. — Go to new accounts counter and tell the teller that you want to open a Bagong Bayani ATM account. —The teller will give you an application form. Fill up the form legibly with the required information. Double check the form before submitting it to the teller. — Once done, submit the form together with the requirements and the initial deposit of P100 to the teller. —The bank teller will verify your information and requirements and encode it in their system. —After verifying. the ATM card can be released on the same day, depending on the branch. 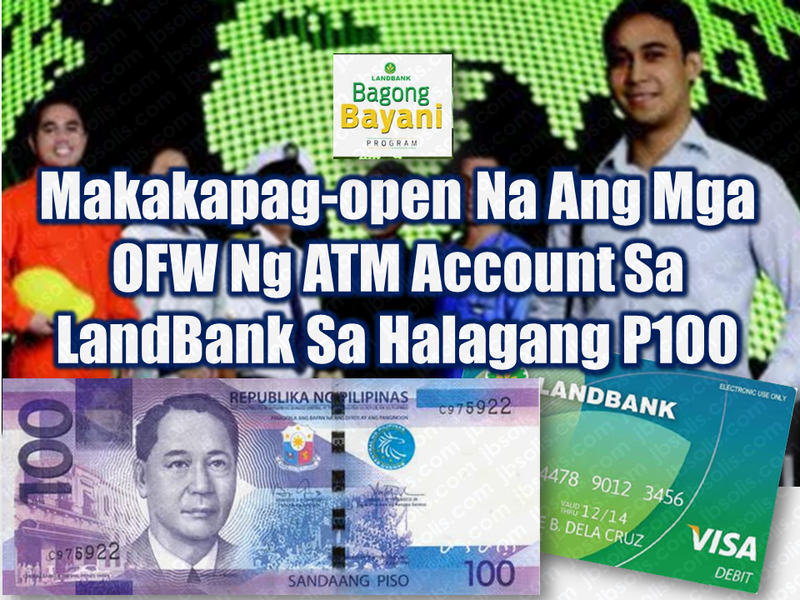 The Bagong Bayani ATM account only requires an initial deposit of P100 and has no maintaining balance. OFWs and their beneficiaries can also open a Bagong Bayani Passbook account for an initial deposit of P100 and maintain a required average daily balance of only P5,000 to earn interest.